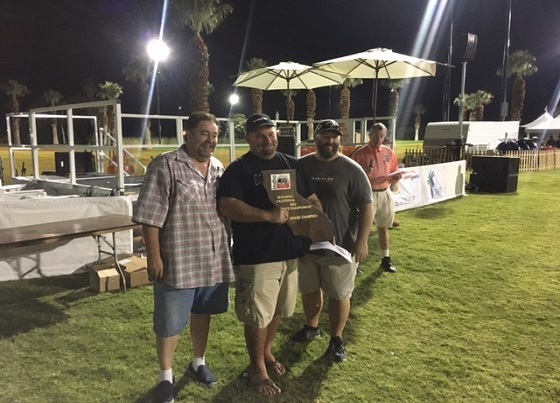 Indio, CA – The Second Annual Indio California BBQ State Championship and Festival brought out the best BBQ pro’s in the country for a smoke masters showdown on Saturday, and once again a familiar face was holding the trophy at days end. World Champion Pitmaster Darren Warth from Des Moines and his team Smokey D’s defended their title from 2015, edging out another World Champion Sterling Ball of Big Poppa Smokers. Close to forty teams competed this year for a prize pool of over $10,000. The festival was again a huge draw for locals, bringing a crowd of over 6,000 to the Saturday event. Many of the competition teams made their BBQ available to the crowd, selling plates that ranged from $5 to $8. The chance to eat world-championship quality BBQ drew many to the event. The BBQ Festival also served as an official kick-off event of Coachella Valley Beer Week, offering a variety of craft beers guests could enjoy while exploring the grounds. A variety of entertainment kept the event lively, with a focus on the main stage where groups played everything from Jazz to classic rock. Local bands like Sunday Funeral and Alchemy played through the day, with Grupo Unico closing out the event with a lively dance floor. The festival also featured a kid’s fun zone and a wild west show. “We are very pleased with the event” said Greater Coachella Valley Chamber of Commerce CEO Joshua Bonner. “We made some minor changes to the parking and layout to help enhance the overall experience. Our main goal was to keep the focus on the BBQ, which we felt we did. At the end of the day it’s the BBQ that makes this event unique.” Major sponsors of this year’s festival included Title Sponsor Chandi Group USA, The City of Indio, the Indio Water Authority and Fantasy Springs Resort Casino.